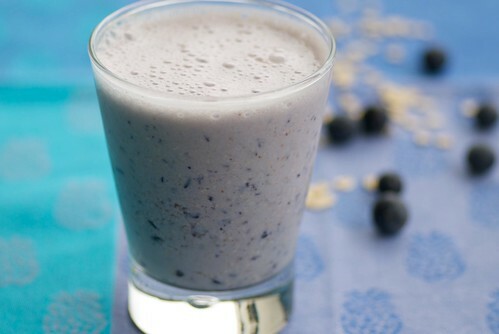 When you're too rushed, too tired, or too lazy to make yourself a healthy, balanced breakfast, make this blueberry, oatmeal, and honey breakfast smoothie. It's got everything you need to kick start your day: fiber, protein, whole grains, vitamins, antioxidants, and frothy deliciousness. And it can be made in about two minutes. Who said Mondays weren't happy? This breakfast smoothie is also delicious with strawberries, blackberries, or raspberries. 1. Place all ingredients in a blender and process until smooth and frothy. Add more milk if you prefer it thinner. This is the second smoothie in my Summertime Smoothies series. Don't forget last week's: Cinnamon-Spiked Cherry and Banana Smoothie. I often put oats in my smoothies for staying power. I love the bulk (without the cals) that they add! I tend to put oats in my smoothies too. Now I will need to try the honey. I have never tried oatmeal in my smoothies. 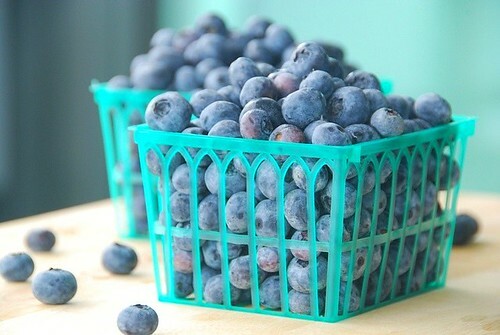 And this is perfect timing because I have a whole bunch of blueberries right now, they've been on amazing sale. And my daughter doesn't want to eat anything except smoothies. Blueberry smoothies are my absolute favorite. Thank you for sharing this delicious recipe; I love finding new ways to spice up my smoothi! I will most certainly being trying this soon! You are the Queen of Smoothies! It would DEFINITELY make me happy to wake up to this! I love that it has oatmeal in it...I've never seen that before. I can handle this! I freeze all my blueberries early in the spring. Can I use them - instead of adding ice - or should I still add a few cubes? It's like blueberry oatmeal, but drinkable! I use oat bran in some of my breakfasts. Will it work with similar results in this smoothie? Monday sure are good, if you are drinking yummy smoothie like this. I have not tried smoothie with oatmeal ever so this is unique and sound much healthier, thanks for sharing. The oats are a great idea! I never think to add any type of grain to a smoothie, so I'll have to try this. This is a pretty & very perfect smoothie. We love blueberries and oats over here. That does sound like a happy way to start out the day. Great thought to put oats in there. wizzy-Try it. You'll like it! anonymous- Nope. The get chopped in the blender. foodhunter-Oh, I love a dab of honey. Not too sweet, just right. allthingsorganic-Thanks! I adore blueberry smoothies too. joanne-It's really good. Give it a try! ramblingtart-Now you just made my day! juliana-So glad you like it! abby-It depends on how frothy you like it. When I use frozen berries I usually skip the ice. pam-The oats add fiber which is healthier. Fabulous smoothie! I love the oatmeal in there. I would never have thought of adding rolled oats to a smoothie but nowI am intrigued! First thought out of my head was "oh my goodness! That's the best thing I've ever tasted". Its delicious-- Thanks!